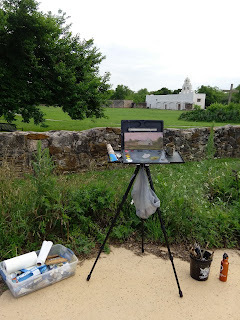 This was a 30 minute sunset study at Mission San Juan in San Antonio. I was trying to paint the Mission when I decided to stop and paint this tree instead for half an hour. Here's my set up at the Mission. I was still an hour away from sunset so I walked 10 feet to my left and saw a great subject ready to be painted.